While the Czech Republic was knee-deep in snow, we went for a short trip to my motherland, the Philippines. It was the first trip for my family to this land of eternal sunshine, and we all enjoyed it immensely. Our first few days were spent in Manila, where I was able to meet and spend time with my long-time friends. We stayed at a hotel in the Makati business district. I specifically chose this location because it was not too far from the airport and close to one of the popular malls in the city. Prior to our trip, I’ve read news about the worsening traffic in the metro, so I decided to have us stay in a place where meetups will be convenient and a trip to the airport will not melt the snow folks who are travelling with me. It was great bonding with my friends again and I was happy that my family instantly became comfortable with them. After 3 days, we flew out to Bohol, where we spent the most time in. Everyday there was something in the itinerary. A few of the places we visited were…. The exotic animal park in Loay, where my son and my husband fearlessly petted a snake. The idea seemed cool, but it was not to my liking. I would rather watch them at a distance. On this trip, I was also able to show my kids where the rice comes from. If you have ever met a Filipino, you would know that we love rice. It is such an important element in our culture. I have yet to meet a Filipino who doesn’t like rice. Another famous attraction that we visited is the Loboc floating restaurant. I have been to this restaurant several times during my younger years, and I was quite happy to go back there. I have noticed a few improvements from the last 10 years. The port is now well-built and those boats themselves had a little face lift. But what amused me though were the air-conditioned bathrooms. Finally someone figured out that a restroom should live up to its name — a place to rest. Those restrooms provided visitors a much-needed respite from the tropical heat. On this same journey, we also hit another major spot, the Chocolate hills. The hills were not very “chocolatey” on this visit because it was just the end of the monsoon season. Every day it had its daily dose of rain. On the way there, we also dropped by the Bilar man-made tropical forest, where we paid a visit to the all-knowing Tarsiers of Bohol at a conservation park nearby. Before heading out for home, we decided to drop by a butterfly sanctuary where there was much fun to be had. We had a very funny guide who told us that he used to work with a Czech volunteer. It was interesting to know that like Filipinos, Czechs are also everywhere. Like this Czech butterfly for instance. Stay tuned for the next part of this butterfly’s Philippine adventure. It’s taking me forever to write the second installment of our recent vacation to the Philippines. But here it goes…. One of the main reasons for taking the trip at that time of the year was to celebrate my mom’s 70th birthday. It was one of those rare occasions where we were all present, so it was just about right to have a family pictorial. My sister did all the arrangements and I think she did a pretty good job. These photos were taken at my aunt and uncle’s residence in Valencia, Bohol. The place where the new house now sits used to be my grandparents’ ancestral home. Those who know my aunt and uncle are aware that they are an amazing team. Both smart and artistic, they did an amazing job in renovating and landscaping their place. I was blown away with how they turned this once sleepy beach-side property into a tropical paradise. Here are a few of my favorite pics. My beautiful mom rocking 70 with my loving dad! All of us together. The kids cooperated somehow. On that same day, we also celebrated mom’s birthday in one of the best resorts in Panglao, Bohol: The Bohol Shores. It was a small celebration with our direct relatives. Love these people. Can you see the resemblance? The pillars of our family. And of course, a Filipino party is not complete without lechon (roasted pig). The night ended well. Save for a few hiccups, everything went as planned. My brother and sister takes all the credit. They both planned and organized it while I was communicating and approving from afar. To cap off the night, here’s one wacky pose by the pool. There is no doubt that the Czech Republic is a beautiful country. Not only is it rich with architectural treasures and natural wonders, it also has a very colorful culture. One of these interesting cultural practices is the observance of a name day. In Czech culture, the calendar has a set of names. This means that every Czech person’s name is based on the calendar. If you are Czech, forget about naming your child “Northwest” or “Vector Ion,” if you do not want to go through the trouble of obtaining a permit and paying a fine. Parents wanting to name their child differently would need a special permission from a Czech authority to be able to do so. Having one’s name derived from the calendar also means that each person has a name day. So everyday in Czech is somebody’s name day. It is kind of a big deal. The name day is celebrated like a birthday. You wish the person a happy name day and give him or her a little present like a bouquet of flowers and a box of chocolates. Two weeks ago, we celebrated my daughter’s name day. For our family, it is pretty much the last name day celebration for this year. In as much as I would like to observe all the cultural festivities in Czech, I’m glad we’re done celebrating name days. It is a celebration that I always forget. Perhaps because I don’t have one. Summer came and went. And what an eventful summer it was. So eventful that I couldn’t even begin to sum up everything in words. 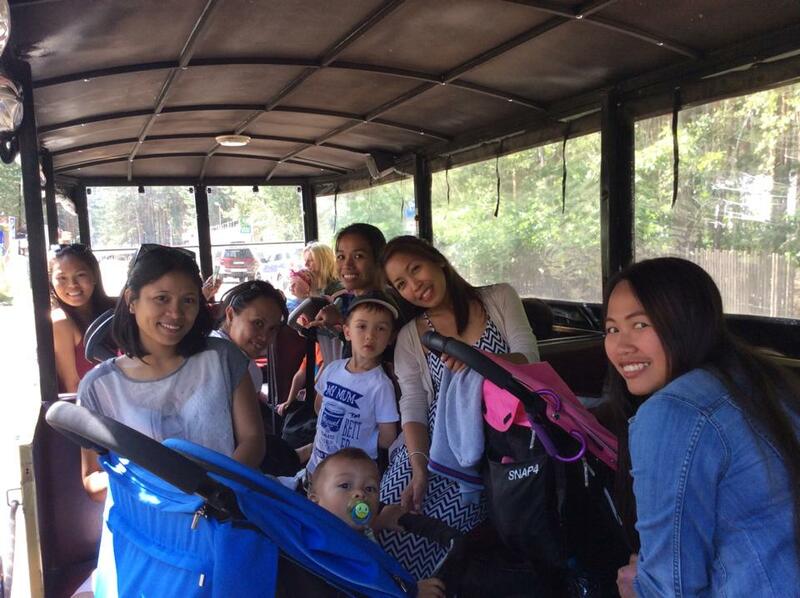 Not only were there a lot of outings and bonding activities with friends, we also got to travel longer than 9 hours…. in car. 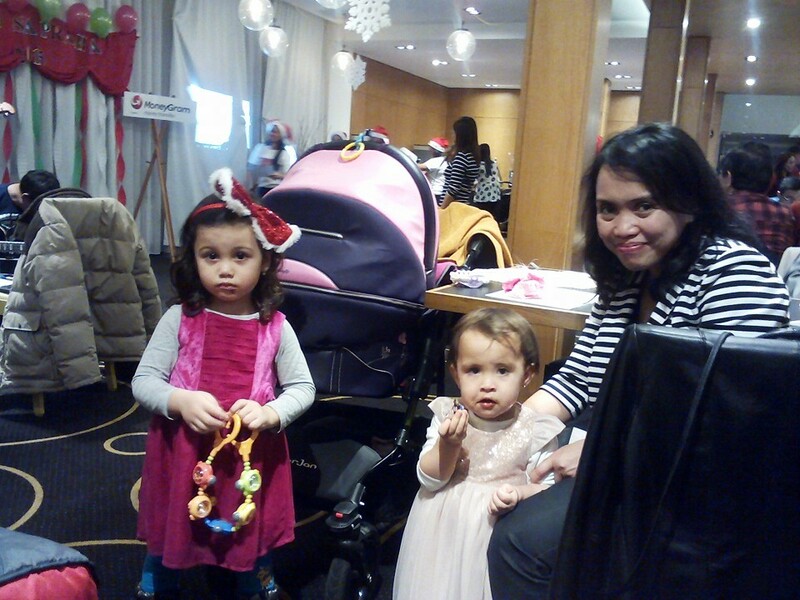 Since our kids are grown and without diapers, we felt that it was high time to do long journeys. And off we did. Our main destination: Croatia. It was my kids’ first time to be out in the sea and boy, did they enjoy it. All those seven days that we were there, we were out in the sea twice a day. It was very refreshing and inviting. Travelling with friends made it more fun too! And guess what? I even made an unplanned side trip to Venice by boat. It was beautiful. I’m glad I went. Despite the expected mob of tourists, Venice is Venice. Its beauty is unparalleled. But the adventure didn’t end there. On the way home, we dropped by Slovenia. Since all this travelling was done during the day, our main goal was to get the kids tired so they will sleep the entire way home. But I was pleasantly surprised by the beauty of Slovenia. It’s one of those little quaint states that has everything — sea, mountains and panoramic landscapes. 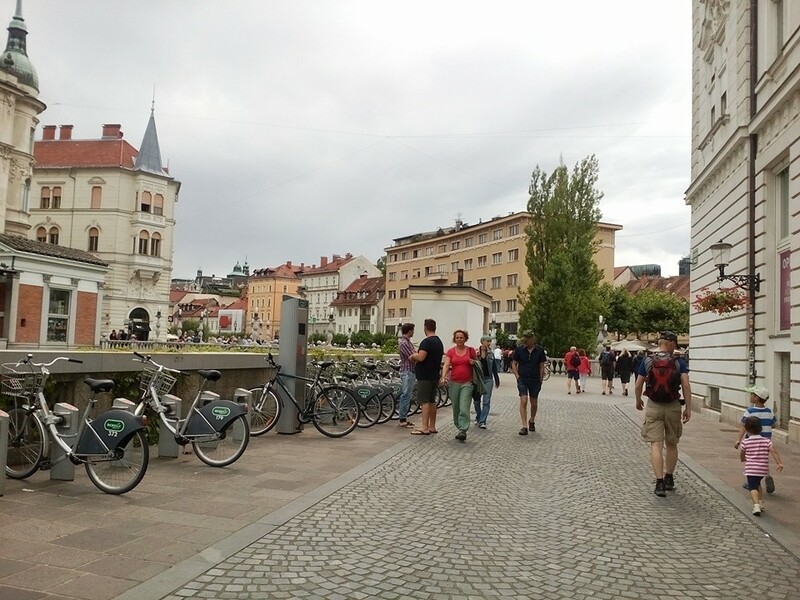 We only got to see Ljubljana this time, but I’m sure this will be a destination that we will visit again. I especially love the fact that the city is very bike-friendly and everything is walking distance. 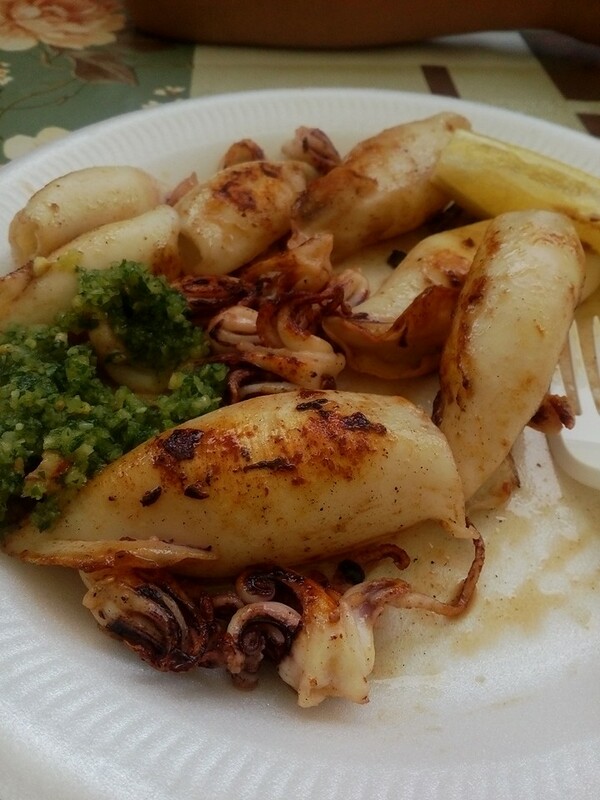 we also got to sample some Slovenian seafood goodies. It reminded me so much of the Philippines. After spending a few hours in Slovenia, we headed for home with tummies full of goodies and hearts full of memories. If you had been wondering what I’ve been up to lately, suffice it to say that I have been working. Working on myself, that is. Finally my children are at an age where they are not too dependent on me and I can actually go out. I have recently started a diet and exercise program (updates later), and I have also started to go out with friends without having to tag my kids along. 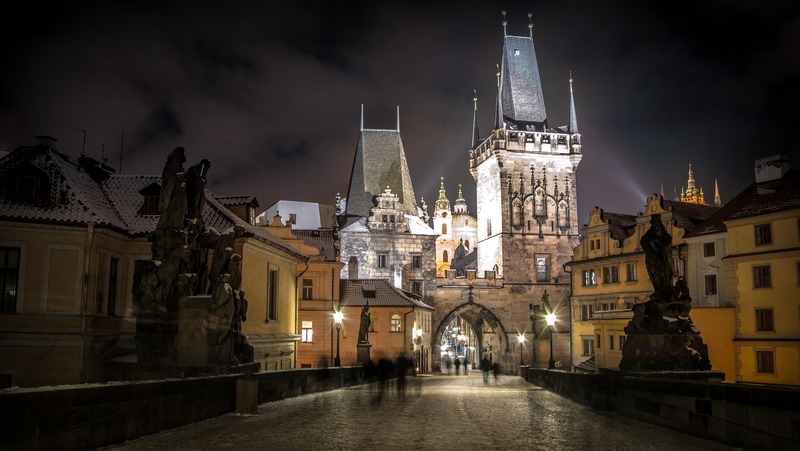 This past weekend, I decided to take a night out in Prague with a few friends. We went to Kstar Karaoke bar, the only Karaoke bar in Prague specializing in private room karaoke, where guests can have a room to themselves and sing in front of people they know. The concept of this type of bar is nothing new. It is an Asian concept, and I was told that the owner of the bar got this idea from Japan after living there for several years. Those who know Filipinos and have spent time in Filipino communities will know that we love karaoke. Hence, it was no surprise that we completely enjoyed the experience. The room was spacious enough for all of us, and food was allowed to be brought in. (Probably one of the biggest pros about this place.) The bar was well-stocked with a good selection of drinks and the song selection was also a good mix of old and new pop hits. Most of their customers are foreigners, and they also cater corporate events for some companies and organizations who are interested in this type of entertainment. Although karaoke is not a popular Czech past-time, I was told that more and more Czechs are starting to take interest in this form of entertainment. Perhaps the only downside for this place is that it didn’t have a parking space, which is quite common for establishments in the city center. I also found the microphone wires bothersome. But Marek, the manager told me that plans are underway to change that. They are planning to do a system upgrade where everything will be touch screen. All in all, it was a pleasant experience. It is good to know that a place like this is already starting to gain popularity here in Prague. I think I’ve just found a new hangout. One of the things that I love most about the holiday season is attending and organizing parties and events. Yesterday, my kids got to attend 2 significant cultural events: A Filipino one and a Czech one. Our day started off by attending a Filipino party in Prague. 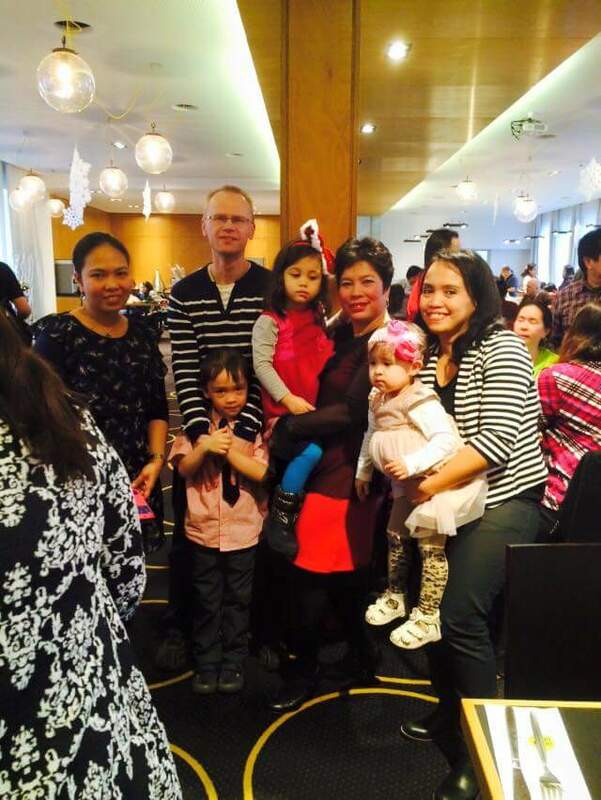 It was an event organized by the Filipino community and was open to all Filipinos in the Czech Republic and their families. It was a typical Filipino party with lots of food, a load of entertainment and attended by a bunch of loud, happy people. My husband, who is not used to huge parties, used to shy away from these events. But after several years of being with me, he now enjoys it immensely. Even my children love these parties. And what’s not to love? There’s always lots of candies and a friend to play with. But as much as we wanted to stay the whole night for this year’s Christmas party, we also cannot afford to miss another event that was awaiting us back home . It was the eve of the feast of St. Nicholas (Svaty Mikuláš). 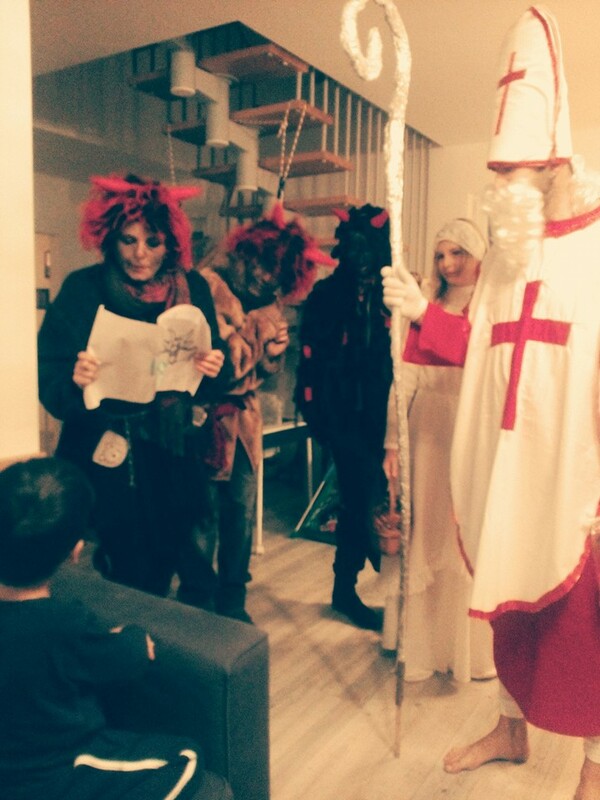 They got to be visited by 3 interesting characters: a devil, an angel and Mikuláš. My Jakub is at an age where he is still very impressionable, so he excitedly recited a rhyme and even sang a song for our guests. Michaela on the otherhand, is now at the stage where she likes to imitate her older brother. Not to be outdone, she also recited some nursery rhymes that we always do together. 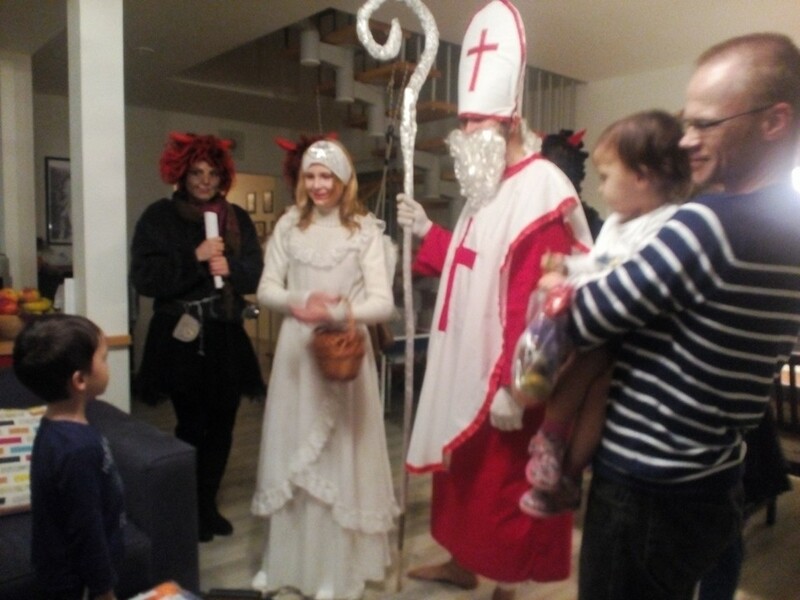 At the end of the visit, the kids got a bag of goodies and some candies from the angel. That’s their prize for being good the whole year! With all the events my kids got to attend yesterday, I’m sure I’m not the only one who loves December. And because we are a bi-cultural household, it’s always twice the fun! It has been almost a year since my last entry and now that I am trying to write again, I honestly don’t know where to start. It was a very eventful summer that I barely had time to pen down my thoughts. Anyhow, I guess one of the major highlights of this year is the camaraderie I formed with some moms who are in the same situation as I am. That is, married to a Czech man and raising children in a Filipino-Czech household. 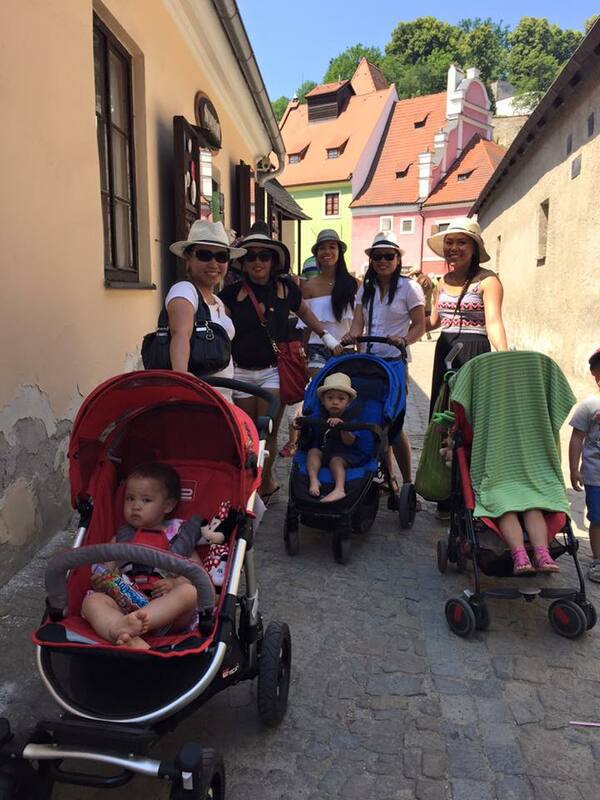 After all, this is what this blog is all about — me sharing my experiences as a Filipino mom in the Czech Republic. It was also very interesting that our children are almost the same age, so we were able to go out and have fun and the kids were able to play together. We did two major trips this summer. The first one was in Cesky Krumlov. Photo courtesy of Raquel M.
It was a very hot day the day we went, so we weren’t really able to walk around a lot. But despite that, we still managed to have fun. It was a 3-day, 2-night trip so we were really able to bond and get to know each other. So did the kids. It was no wonder that we decided to repeat it again in Doksy. Doksy is a town located in one of the biggest man-made lakes in Czech, Macha Lake. The lake was named after the famous Czech poet and avid hiker, Karel Hynek Macha. Macha was believed to have walked through the area where he found inspiration for some of his poetry. 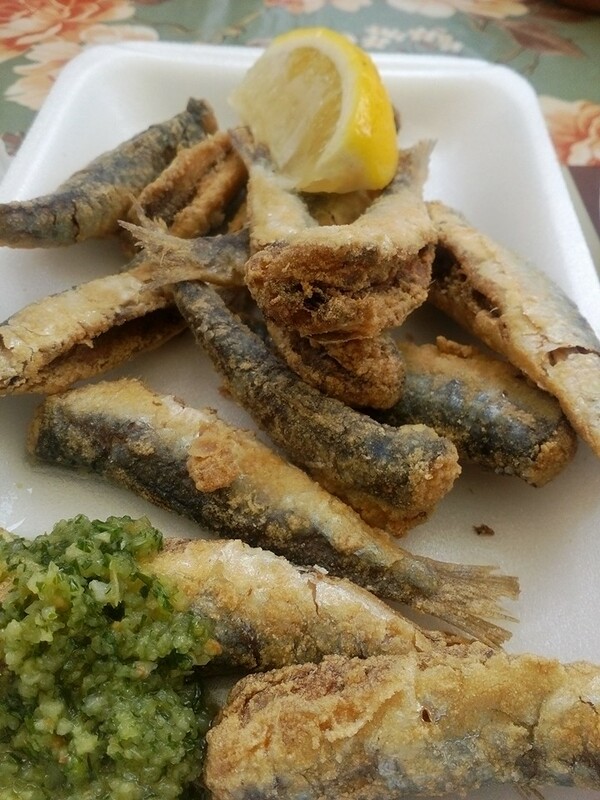 But for us Filipinos, it was a taste of the sea. As you may already know, Czech is geographically located in Central Europe and really far from the sea. 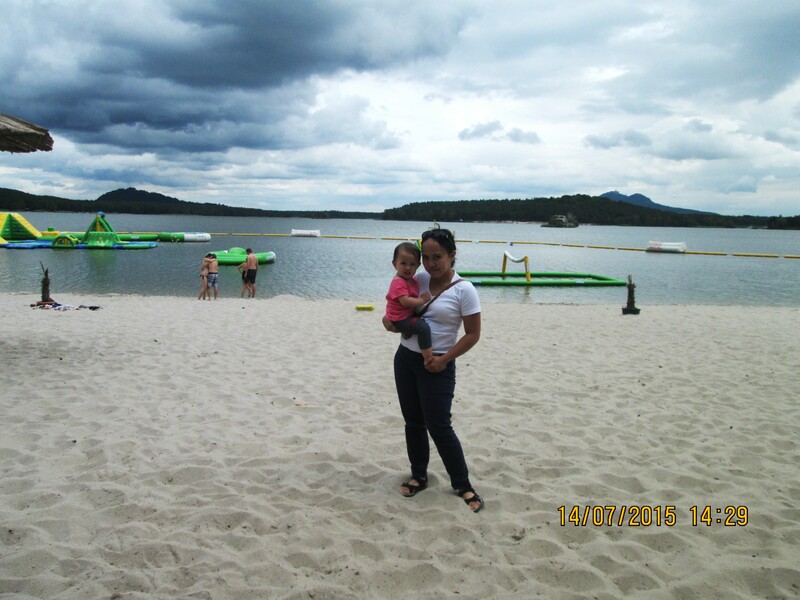 The lake provided a a quasi-beach for us, and it was great to feel like we were in the Philippines again. While my little daughter was very clingy, her older brother blended right in. 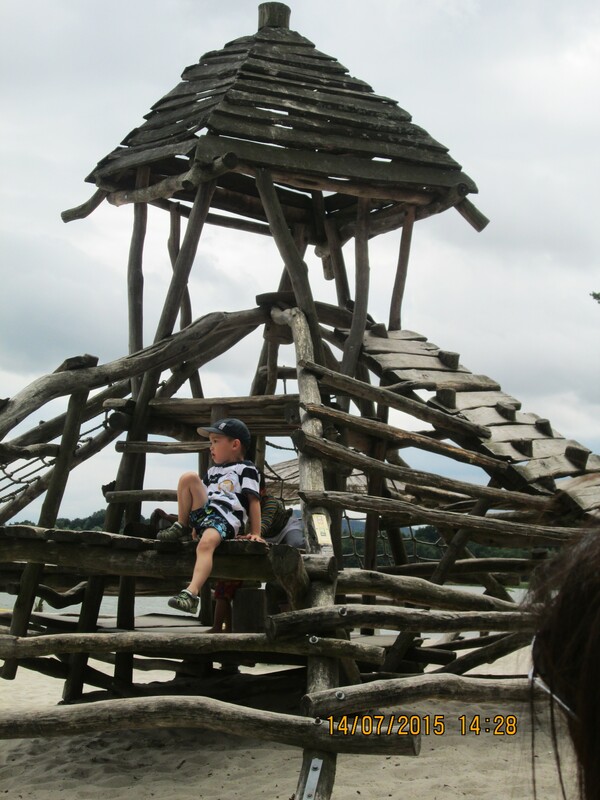 He immediately raided the first beach structure that he saw. It was not a very bright day that day, so most of us decided not to take a dip in the beach but just enjoy the sights, the air and the stories. The next day, we decided to take a touristic trip around town aboard one of its trolley cars. With Czechs being on the conservative side, it was very unusual to see a large group of foreign-looking foreigners in this part of the Republic. Thus, we were not able to escape from the stares of those we met along the way. It was another fun trip that not only the moms enjoyed, but the kids as well. 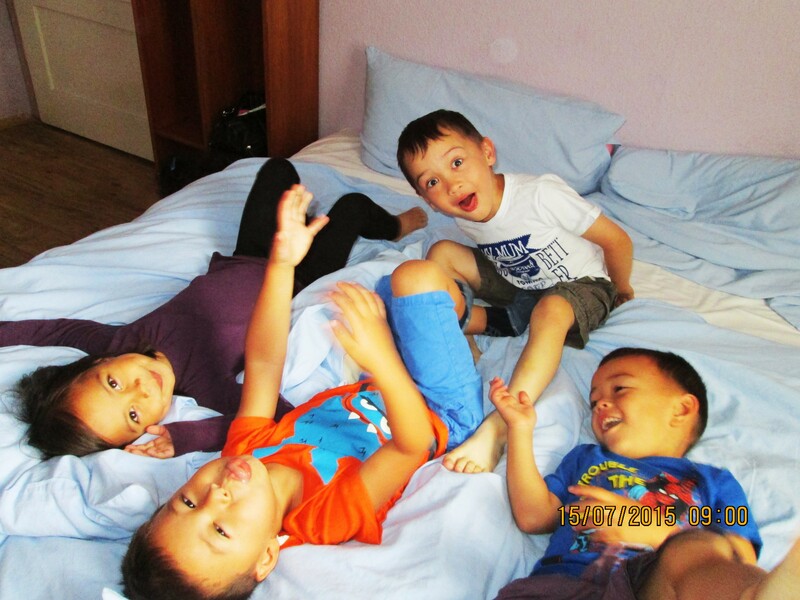 Personally, I was happy that my kids bonded with the other Fil-Czech kids. Finally, it is a group that they belong to. 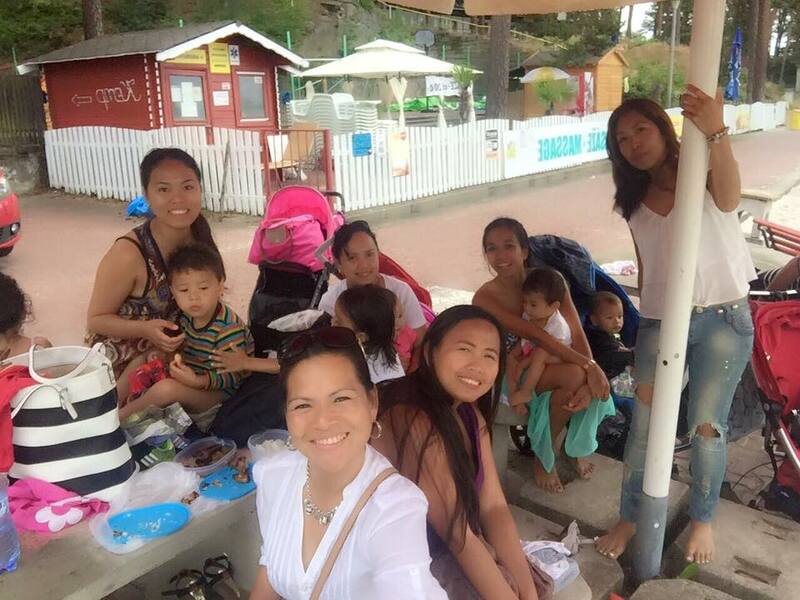 They are Filipinos, but not only partially so. They are also Czechs, but only partially so. If it ever came to a point where they would see themselves as different from the Czech kids around them, it should provide comfort for them to know that there are others like them. And it’s fun to be different.